You may remember my original post on this topic when I admitted that I enjoyed didn't mind swapping spit with my then 4-month old. There was something so pure about Ari's saliva. He never had morning breath. He had no signs of gingivitis. He didn't even have teeth for goodness sake. If he wanted to drip a little drool in my mouth, I would be happy to swallow it. The french kissing with my baby did come to an end and life went back to (spit-free) normal...or so I thought. The very quick background: Our bathroom isn't huge so Matt and I take turns in the a.m. and p.m. performing our hygienic rituals. While he's brushing and flossing, I'm getting dressed or undressed, and then we switch. Here's a photo of our bathroom vanity. 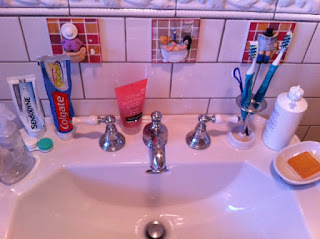 Notice the back right - Matt and I use the same make and model of vibrating toothbrush. Mine is in front. Matt's is in back. Oh wait, actually, scratch that. I was just informed that mine is in back. Matt (enters the bathroom to grab a q-tip): Why are you using my toothbrush? 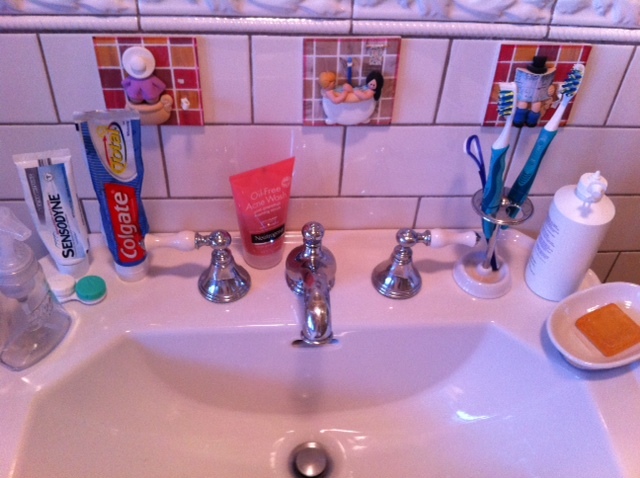 Me: Your toothbrush is that one in the back. Matt: Incorrect. That's your toothbrush. Me: You've been using my toothbrush. Matt: You've been using my tootbrush. It took me a few minutes to get the gag reflex under control, swish with mouthwash, and then re-brush my teeth with my toothbrush. Matt: Wait, maybe that's my toothbrush. Who really knows. Dental damn-it! As soon as Ari wakes up, we're going to CVS to buy me a new toothbrush. Lol!!! This just happened in my house too. Too funny somehow it does matter.